We are looking for sponsors and donors to keep our lively group going! Although we are a volunteer group, we still have expenses such as insurance, royalties, consultants, rehearsal hall rentals and a long list of other fees we must pay in order to exist. 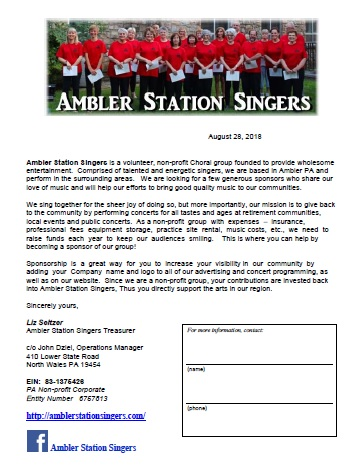 Ambler Station Singers is a fully recognized 501(c)(3) charity, so your donations are fully tax deductible. We hope you will consider helping to support us! If you would like to help us out, please download this letter (below) by clicking on it.